Our inspiration comes from your opinions, happy riders around the cities,experiences, elegance and comfort, mixed with some unique and fresh FabricBike touches. A bike that turns heads wherever it takes you. Five different trendy colour combinations, lightweight, maintenance free and easy to ride thanks to the use of Shimano Nexus 3V. 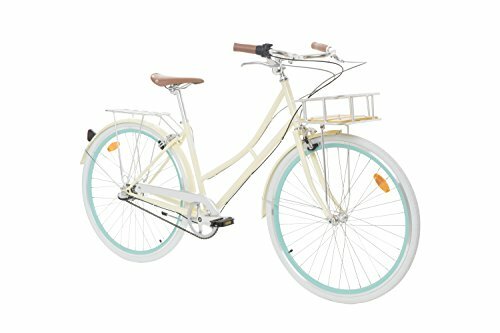 Also features a comfy high quality looped frame and plenty of extras: rear rack, bell, fenders, kickstand. A perfect bike for commuting, gliding in a park or heading to the local market. Featuring exceptional quality materials with quality and value in mind. Our aim is to put a smile on you. Because we have you in mind, Fabric City is made just for you. SPECIFICATIONS Frame and Fork: 4130 chromoly down Tube. Remaining tubing Hi-Ten steel. 3-speed Shimano Nexus Twist. You just need the turn your grips and the gear will change. Polished aluminum handlebar: 25.4mm. Alloy Bell Mid-Century. Double wall aluminum rims with 30mm wide profile. Wheels: 28¨. 700x35C Kenda Tires and camera. Shimano Nexus Internal 3 Speed. Aluminum front hub bearing. :14Gx36H 3/8 "x 100x140mm. Seat Post: Alloy, 300mm x 25.4mm. Crankset: 3 pieces forged aluminum. 44T x 170mm. Aluminium Brake calliper with lever 22.2mm. Seat post and stem in forged alloy. Saddle Fabric City. Pedals Wellgo with rubber grip. Sealed bottom bracket. Cartridge 68mm / 105mm. Included: Rear alloy rack, kickstand, front and rear fenders and reflectors, alloy front basket with beverage holder. Weight: 14 Kg.